Mastered techniques towards executing your next painting project to total perfection are adopted by the experienced painting pros in the business. Their work is fast and also efficient. Every other pro in the trade will have his or her own special kinds of strategies which are their trade secrets. We have run our professional painting company for over 15 years and implemented many of these techniques and tips in our business. Having worked with so many professional painters, watching and learning about their execution of high standards of quality of work on various types of finished projects, we have come up with some unique tips and techniques to the highest standards which can assist you in tackling your next exterior painting project. Good surface preparation is key for great results for any exterior painting project. If the house needs to be Cleaned first, it should be washed or power washed with a TSP and bleach solution or a common mildew remover to Remove any dirt or mildew on your home prior to painting. All cracks and gaps should be caulked with a quality Brand of quality and all holes and minor defects in the wood And trim should be filled with a proper spackle or Filler and then sanded with an appropriate sandpaper. Tinted primers will help hide your top coats. Make sure to “spot prime” any areas where you have used spackle or Fillers with your tinted primer prior to painting and give a sufficient amount of time before top coating with other Paints. Always read the manufacturer’s directions on the can for proper application and drying times. Extenders are used to give you more working time with the paint. There are both extender products available for oil Based and water based acrylics and latex paints that will allow you more working time with the paint. This is Sometimes important when working in warmer weather or other less than ideal working environments. Using drop cloths that are made out of a cloth canvas are good in not damaging any surfaces you are working around such as concrete sidewalks, walk ways and decks. A benefit of using a quality cloth canvas drop sheet is that spills are easily removed and they will not penetrate through the drop sheet and damage any underlying surfaces. And continue on from this area. This is called keeping a wet edge. This allows for the paint to dry evenly and allow you to brush or roll into the work you have just completed before it has had a chance to start drying. By keeping a wet edge you will obtain professional quality results anyone would be proud of. Make sure all surface are clean before trying to tape to them. Dust them off and wipe them down prior to taping. Make sure all areas are adequately taped and masked to protect any surfaces that you don’t want painted. When paint is manufactured it is made in batches. When purchasing new paint for your exterior painting project try To purchase the amount of paint you require to complete the entire project. Paint can vary slightly from one batch to the next so Make sure to always check each can or pail of paint to make sure it matches to all the Others. This can be done by taking a wet sample from one can or paint of paint and Added it to the other to see if the color looks consistent from one can or pail to the Next. Roller sleeves and brushes need to be washed with warm soapy water for latex paints and the appropriate solvent for oil based paints. Wrapping your brushes or roller sleeves in plastic can be okay for the short term but will dry out quickly over time. Use a proper cleaner with walls that are dirty or have mold or mildew present. Make Sure to use a good quality TSP (Tri-Sodium Phosphate) and bleach solution or a pre-Made mildew remover such as “30 second cleaner” when preparing for your next Exterior painting project. Always start with the loaded brushes rather than wiping off on the edge of the paint can Time after time. After the brush is dipped, tap it side to side in the paint can to hold the Paint in place. Call for professionals for assistance. 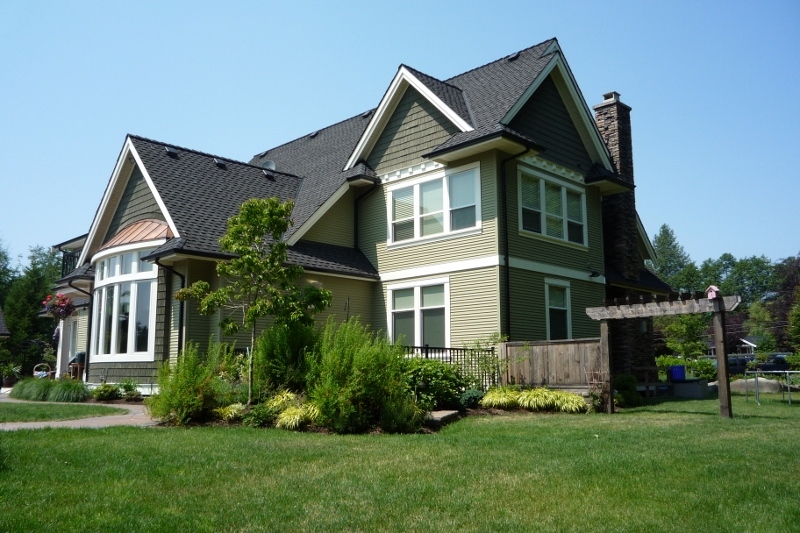 Always hire a professional painting contractor such as Sherwood Painting & Decorating, Your Metro Vancouver Painting Contractor to complete your exterior painting project with Great results and professional service. Do not work on costs constraints alone but look at the quality of the work. Going for the Cheapest price is not always the best. Meeting with 2 or 3 different painting companies And getting comprehensive estimates with detailed quotes outlining the scope of work to Be completed, check references, their liability insurance and making sure they are covered with worker’s compensation coverage and this will help you choose a painting company not only by price but with quality and peace of mind knowing that the company you have Chosen is a professional in their industry.